I am attending the Interactive track with 17 of my fellow ElevenMoms, our sponsors, a couple of good friends, and a few bloggy associates. Since this is my first year here, I am completely overwhelmed by the number of people present and the wide array of sessions available for us to attend… I really feel lost. Thank God for my friends! Lori, Tara and I had some errands to run (also known as shopping) that took us away from the action, this morning, but we tried to make up for lost time by browsing through the mile-long schedule of sessions, only to give up and decide to walk around to see who we could meet. We started with the Trade Show and began passing around our cards and cute little 11Moms stickers to anyone who would take them. 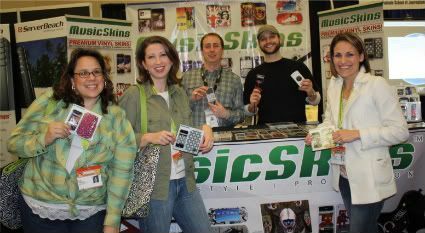 Our aimless wandering this afternoon paid off… We met a ton of great people and even scored some fun skins for our iPhones from MusicSkins. I can’t wait to apply my Flower Girl to my phone (ahem, yes I know I don’t actually have an iPhone yet, thankyouverymuch…). Tomorrow will be a big day, so I’m heading off to bed now. If you’re here I would love to meet you, so come find me ~ I’m the one wandering around with the bewildered look on my face. Sounds like fun! I have been reading all the tweets, trying to keep up. Hope you had a great time!